I recently posted a 'Panna Cotta' picture on Instagram and lot's of you asked for a recipe. It is super easy to make and you don't need a lot of ingredients and no fancy kitchen tools. What I love about it, is that you can make so many different variations. 2 packages of 250 ml unwhipped cream. 40 gram of Xucker (a sugar alternative). Topping of your choice, I chose blue berries. Fresh fruit is in my opinion better because this is already a very high calorie dessert. Warm up the unwhipped cream until it is almost boiling. Put the gelatin sheets in some water to soften them. Cut the vanilla sticks open and add the black filling. Put the panna cotta cream in what ever cups/glasses of your choice. Let it cool down for about 4 to 5 hours in the fridge. So, you can skip the sugar, put only one vanilla stick in there. It all depends on how you like it. If you prepare the panna cotta the evening before, it will be even tastier than if you prepare it fresh. The vanilla has really sunken in and the gelatin has totally hardened. 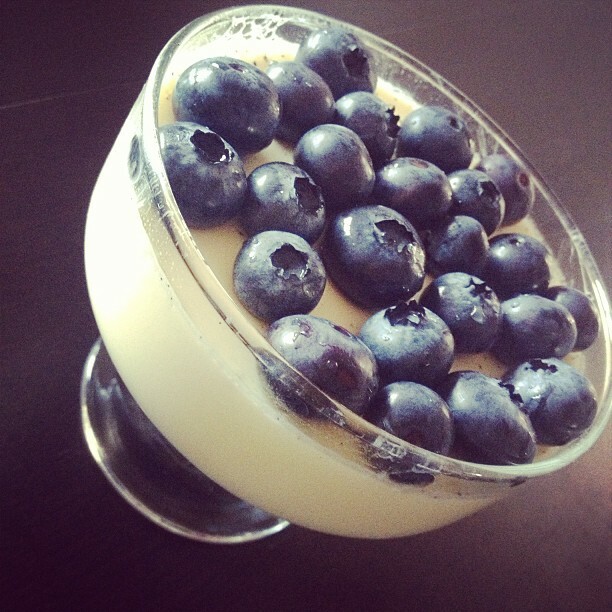 Let me know how your Panna Cotta has turned out and please post a picture on Twitter and Instagram with #smoonstyle. Looking forward to seeing your versions! I'm crap at making desserts. I can make badass pancakes though. I have wild strwberries growing in my garden. Come over to my house & I'll make you a fruit salad you will never forget Simone! Honestly I hate the jelly and I do not really like the Panna Cotta, but I love cooking so much! Is one of my favorite hobbies! It's pretty sad that I'm allergic to milk.... But maybe lactose free cream does the same job? Looks so yummy!!! I will try it haha but I'm so bad at this stuff. Very nice though!! Is "Xucker" a sweetener like "xilitol"? Sorry, I just know the name in Portuguese.